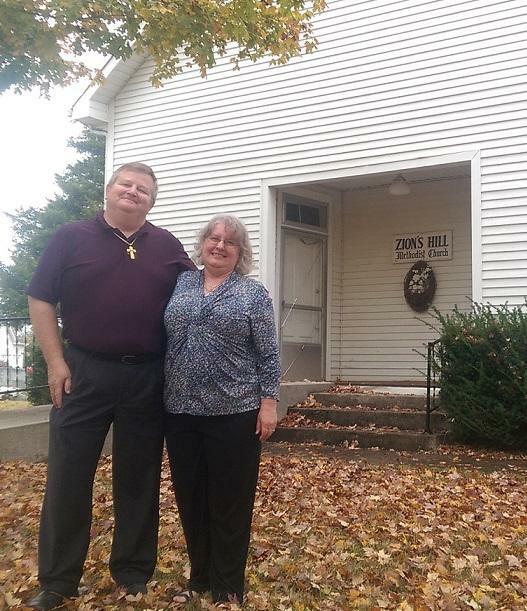 Pastor and Mrs. Dan Sweet in front of the Zion's Hill United Methodist Church in Unionville, Tenn.
UNIONVILLE, Tenn. (WMOT) -- Early American pioneers like Daniel Boone and Davey Crockett weren’t the only adventurers to brave the wilds of North America. Protestant Christianity spread westward across the American frontier thanks in large measure to the tireless efforts of so-called circuit riding preachers. Lay-pastors in many instances, circuit riders traveled by horseback to conduct church services for small towns and isolated pioneer outposts. Today, a new generation of circuit riding ministers are once again traveling the nation’s back roads, including those here in Middle Tennessee. 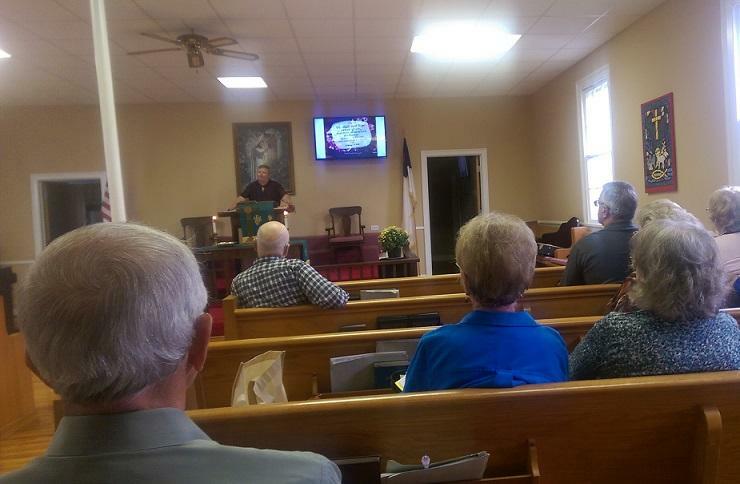 On a recent Sunday morning, Pastor Dan Sweet led services at tiny Zion’s Hill United Methodist Church at Unionville in Bedford County. Sweet is one of a growing number of lay pastors serving Methodist churches, primarily in small, rural congregations just like Zion’s Hill. During the week, Sweet works as Director of Contracts for a large mid-state engineering firm specializing in government projects. He says both of his jobs are full time positions. Member Barbara Waterson has been attending Zion’s Hill church most of the year since the 1960s. She’s now one of just about twenty or so people still attending the 150-year-old congregation. As soon as services are over at Zion’s Hill, Pastor Dan jumps into his jeep and rushes ten minutes cross-country to another small church where he conducts his second service of the morning. Pastor Sweet speaks to the members of the Hickory Hill UMC. United Methodists have been worshipping at Hickory Hill Church since before the American Civil War. Sweet is doing his best to help them keep the doors open, a calling that seems to surprise even him. “Early on in my life I did not attend regular worship services and actually it wasn’t until about ten or twelve years ago that I started…where God really impressed upon me that it was time. He’d let me goof-around, goof-off long enough and it was time now to start doing His will,” he said. According to the prestigious Pew Research Center, the number of Americans who attend church services on a regular basis has been slowly declining for some time. The trend is especially pronounced in the nation’s older, more traditional, so-called Mainline Protestant Churches. Duke University sociologist Mark Chaves has been researching faith trends in the U.S. for some time. He says other Christian denominations should be watching the Methodist experience for lessons on what they’ll likely face in the years to come. Pastor Sweet acknowledges that unless his small churches can attract some new members, they may eventually be forced to close their doors, but he remains optimistic. Sweet is familiar with the Methodist history of circuit riding pioneer preachers. He says he’s served more than two churches at a time in the past and would be willing to do so again, but he’d really prefer to stick with four-wheeled transportation. The United Methodist Church, headquartered in Nashville, Tennessee, wasn’t able to tell me just how many lay pastors currently serve its congregations, but does say the number is growing.